Open Iceweasel and type about:config in the address bar and press Enter. Promise that you’ll be careful. Change the following preferences to the new values shown. Change a setting by double clicking it. I upgraded to Squeeze 64 bit, carried over the UT folder, started UrbanTerror and Crash! For some reason It would not run. I was running UT 4.1 on Debian Lenny (32 bit). Yes I did start the 64 bit launcher… Crashed! So I downloaded UT 4.11. Still crashed. It seems to be a bug, but I did find a fix. I’ll reproduce it here in case that one goes away. I just merged the UT folder and the optimized folder. oq3-urt is the launcher. I pretty much followed my old instructions here. I just had to merge in a few optimized files in the install folder. I had to change the extension to get it on the server. Or just download it from here without having to change the file name: www0.org. Extract ioq3-1807-urt-251210-linux64-tar.bz2 into urt’s executable binary directory (tar jxpvf in console or with a file manager). ioq3-urt now starts the game. You should be in business. I fixed my install. Thanks again to www0.org for the help. I just installed Debian squeeze on 2 of my machines. I’ve documented the process the best that I could. I started to document the process since 5 (Lenny) came out so install would be a no brainer. I’ve decide to put it out there/here in pdf and odt format. Why? Because I think it’s easier to read… plus with the odt, you can save and change the process to fit your situation. Ayway there they are. Use any pdf reader to view the pdf and use LibreOffice to view the odt. OK, I copy and pasted the document below. I would still open one of the above documents on go off of that. It looks the way I want it to in the above documents. If I make any major changes to the document, I’ll make another post. I actually did the 2nd machine/install with the netinstall from a usb stick. The process is the same. Like I’ve always said, this site is mainly notes for myself. my needs. It gives me the basic Gnome desktop install and I’ll add the rest later. Lets start. look like this terry@debiandesktop . Put whatever you want. I leave this one blank. I	t auto filled that one. First thing I do is open up Iceweasle and install xmarks. I use it to sync bookmarks. **Add myself to the sudoers list. Then enter the root password. Now add your username to the list. Now press Ctrl +x and when prompted to save, press y. Then press Enter. also added “contrib non-free” to the end of all of the existing entries. I also added a multimedia repo. There’s one more step after the update. These are the individual packages in the previous string. Some might already be installed. I added a few extra that I like. thing. More in a bit. I’m installing the 195.36.31…. driver because that’s what’s available in the repos. I then rebooted. I usually get the NVIDIA splash screen during the boot. I didn’t this time but I did verify that the driver is installed and working. 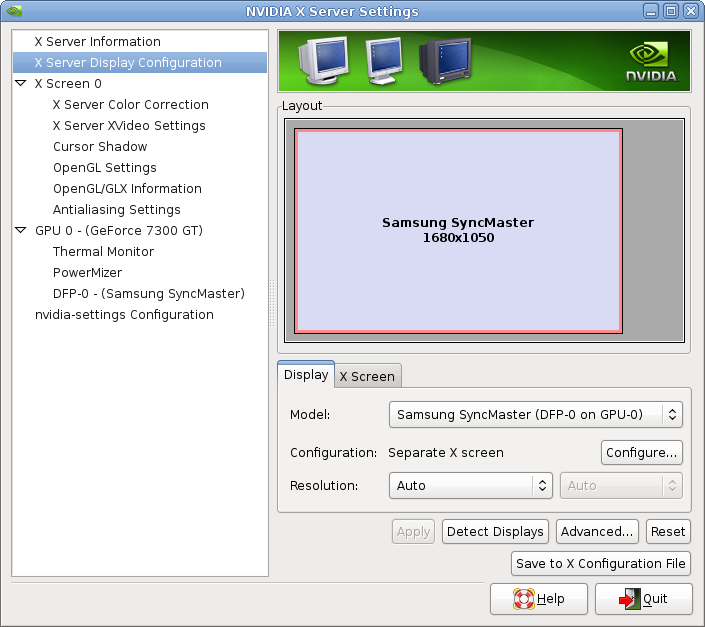 to get to the NVIDIA X Server Settings window (GUI) to adjust settings. Everyones happy…. I hope. Looking for an rss / podcast feed generator? This is a good one. It’s more predictable than the feed generator built into wordpress. More control. I’m looking for and alternate feed for a podcast that I participate in. The Juiced Penguin. The feed that the wordpress plugin produces also includes posts that don’t have a podcast associated with it. I want a feed that is purely a podcast feed. I think ListGarden is it. First we need to download the program. ListGarden : The download is at the bottom of the page I linked to. There are 3 versions to choose from. A Windows, Mac and generic perl version. 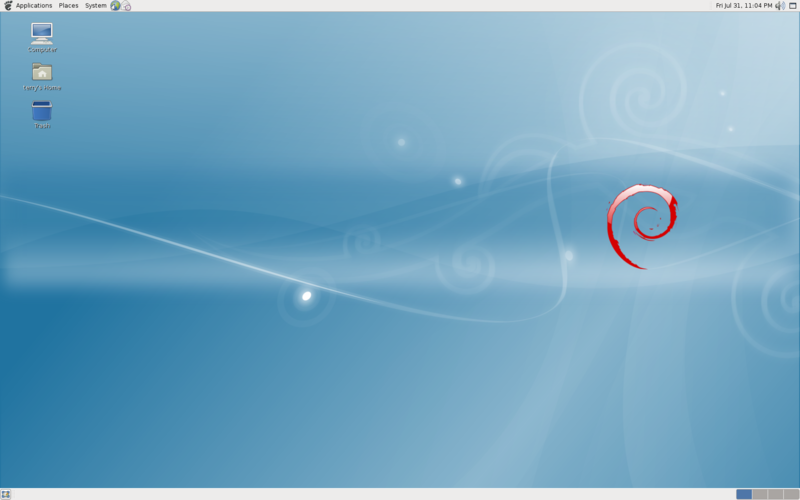 Since we’re using Debian, we want the generic perl version (listgarden-1-3-1.tar). I downloaded the tar file to my home folder. Now you can right click the (listgarden-1-3-1.tar) file and select Extract Here. Navigate to where you saved the list garden file (listgarden-1-3-1.tar). Either way should leave you with a listgarden folder in your home folder loaded with goodies. Alright, now what? Start up the program. Go to that address in your web browser and you’re in business. I’m not going to explain how to use it but I do know that to save or use this program with saved rss feeds on another computer, all you do is save and move the listgarden folder. It’s that easy.